Bradley Wright-Phillips scored a brace as New York Red Bulls got back to winning ways with a convincing 3-0 victory over Minnesota United. SCORE: 1-0, min. 15, Muyl. 2-0, min. 42, Wright-Phillips. 3-0, min. 78, Wright-Phillips. REFEREE: Hilario Grajeda (USA) booked Rzatkowski (min. 38), Warner (min. 39), Ibson (min. 75). INCIDENTS: Major League Soccer match between New York Red Bulls and Minnesota United. The match was played at the Red Bull Arena in front of 14,768 spectators. 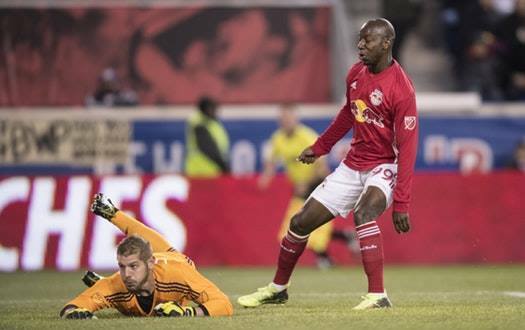 Bradley Wright-Phillips scored two goals to help New York Red Bulls get back to winning ways after a 3-0 victory over Minnesota United at Red Bull Arena. Alex Muyl put the hosts ahead on 15 minutes before Wright-Phillips doubled the home sides advantage three minutes before half-time. The striker hit the post on 56 minutes but did manage to score his second of the game with just 12 minutes remaining. 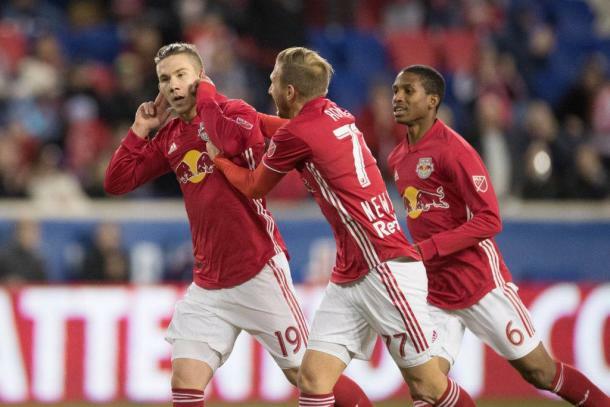 Minnesota struck the crossbar through Ethan Finlay late in the game, but the Red Bulls saw the game through for their second home victory of the 2018 season. After a shock loss on the road against Real Salt Lake in their last match, NYRB were looking to bounce back in the best possible way. The hosts managed to find an early breakthrough. Kyle Duncan found Muyl out on the right and after the playmaker avoided several challenges, weaving in and out of Minnesota players, he struck across goal and into the bottom corner. Jesse Marschs' side was controlling the game and managed to add to their lead on the stroke of half-time. Sean Davis floated a free-kick, from halfway, into the penalty area and after Tim Parker headed the ball on, Wright-Phillips flicked the ball past the 'keeper with the outside of his boot. The home side could've and probably should've scored a third in additional time at the end of the first-half. A clinical move forward saw Wright-Phillips played the ball back to Daniel Royer, who lashed home into the top corner after the ball ricocheted off several players in the area. However, the referee ruled the goal out and the Red Bull player wasn't too pleased with the decision. Muyl was close to netting his second of the game under a minute later, but Matt Lampson did very well to get across and tip the effort of the bar. After half-time, the Red Bulls struck the woodwork after Wright-Phillips guided Connor Lade's low cross, from the left, onto the foot of the nearside post. The striker proved his worth once again though, on 78 minutes, with another top-draw finish. 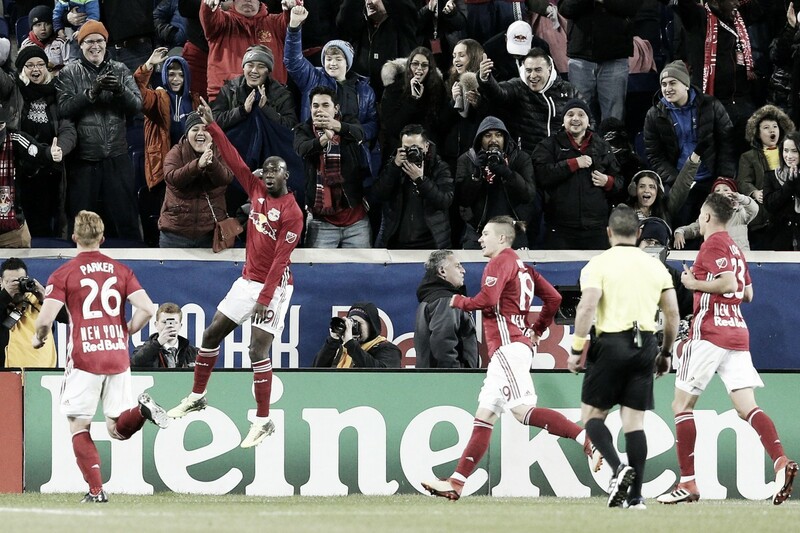 Muyl's through ball released Wright-Phillips through on goal and he curled delightfully into the top corner under pressure – his 89th-career MLS goal. Minnesota threatened to get on the scoresheet themselves nine minutes from time as Marc Burch's free-kick from the left was headed at goal by substitute Abu Danladi, but Luis Robles pulled off a top save to deny him. The Red Bulls 'keeper was beaten two minutes from time though, but United was denied a consolation goal by the crossbar. Substitute Franck Pangop crossed the ball into the box and Finlay headed off the bar. The rebound was struck first time by Mason Toye, however, the ball deflected off his own player and behind for a goal-kick. NYRB are back in action on Saturday as they travel to face Orlando City, while Minnesota returns home to play host to Atlanta United.